Bring the great flavors and aroma off the corner donut shop home with Brooklyn Bean Roastery 100 % arabica coffee beans corner donut shop, medium roast extra bold single serve coffee cups. 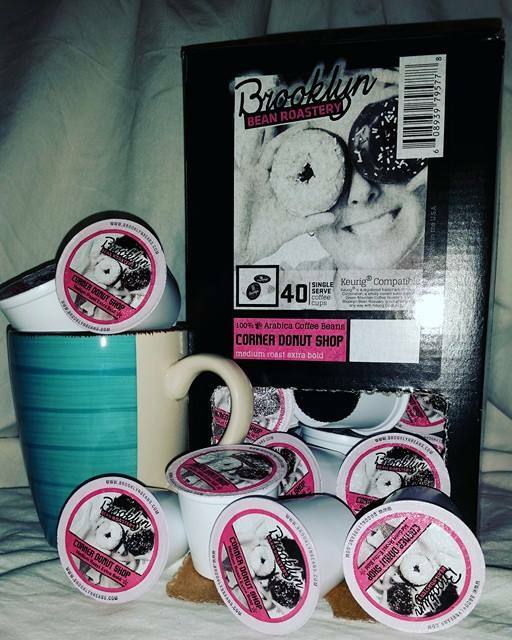 The Brooklyn Bean Roastery - Corner Donut Shop is currently available in 40, 24, 14, 12 and 16 count boxes. There is just nothing like the smell of freshly brewed coffee and thanks to Brooklyn Beans every cup is fresh and easy to brew! Do you like it hot or do you brew over ice? Brewing coffee house coffee is delicious and affordable from your own single serve brewer. Like standing in a subway car and holding on to the above-the-head grab bar, making a great medium roast requires a bit of a balancing act. You want to get a strong, rich flavor that stays smooth and has a very even texture all at the same time. Each of the Brooklyn Bean mediums are specially crafted to bring out perfect balance of crisp nuttiness and full-bodied smoky flavor for the most extraordinary tasting stuff in a cup. There are very few things that Brooklyn does halfway. Lucky for you, a good medium roast coffee is one of them. Enjoy! Would you like to win a variety pack of your own? Enter today!